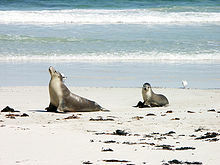 ↑ "South Australian National Parks & Reserves - Kangaroo Island Region". South Australian Government Department for Environment and Heritage. Retrieved 2008-07-03. ↑ "Dog and Cat Management Plan" (PDF). Kangaroo Island Council. 2005. Retrieved 2008-07-03. This page was last changed on 10 March 2015, at 02:10.